When arrived to the office on Monday morning I noticed that Yuma, one of the eBay sellers that I follow from Japan, had added a new guitar, a 1979 Tokai Silver Star SS-36. I’ve always admired, well admired is not strong enough, I’ve always been totally gay for the 3-tone sunburst that Fender used in 1970’s. I even built the Claescaster because of this, since I couldn’t find a Telecaster with the right colour I decided to assemble one myself. 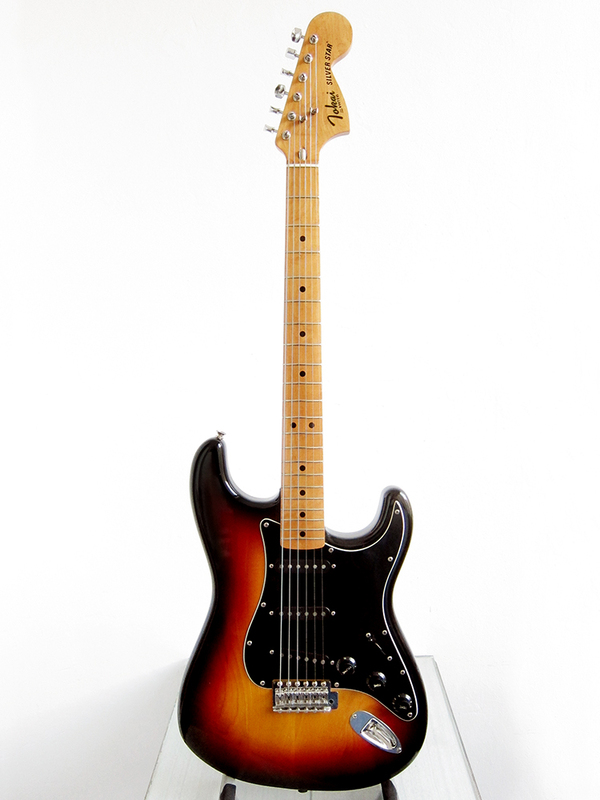 For the past two years I’ve been looking at different Japanese big headed Stratocasters with the 3-tone 1970’s sunburst and black pickguard and was pretty convinced that a Greco SE-500 would be my next electric guitar or perhaps a late Seventies Fernandes Burny but they never seemed to have necks that were fat enough. I was in touch with a couple of the Japanese sellers and asked which brand had the fattest neck and got this reply, none. One seller explained that most Japanese guitars have fairly flat necks since the Japanese have small hands, which sounded a bit racist but whatever the reason is, most Japan made guitars had soft profiled necks up until now. I’ve played a couple of Crafted in Japan Fenders with great V-profile but that’s just in the last couple of years, none of the Japanese guitars that I’ve tried from 1970-80’s has had any baseball bat necks. This was a beautiful looking Tokai Silver Star with great grain showing through the 3-tone sunburst. I asked the seller about the neck and he replied that it wasn’t super fat, more of a soft U-profile, well that sounded close enough to me. The truth is that I’ve really missed the sound of the Fernandes RST-50 ’57 that I had for a short while. The Grey Bobbin pickups just sounded so amazingly good but I could never really come to terms with the small head or the fact that the guitar was black. Eric Clapton’s Blackie in all honour but they look pretty bland and boring to me, I like wood coloured or 3-tone sunburst guitars. My head started to think, well what could be better than Greco’s Maxon pickups, well the Ferndandes grey bobbin pickups, any day. Who was making Fernades in the late Seventies, well Tokai. Does that mean that this Tokai Silver Star will have some form of similar pickups? I tried to do some research but before I had even come to any conclusion I was the happy owner of a 1979 Tokai Silver Star SS-36. It was a Monday morning, I was a bit hungover, most of my guitar purchases has been made in that state, or perhaps when I’m drunk. I tend to be really concerned about money, I like to plan ahead, save for a rainy day, and then suddenly I sit there in front of the computer drunk or hungover without any filters whatsoever and just thinking GAS, GAS, GAS. To be honest I didn’t know that much about Tokai, a part of me has always classed it like Ibanez, kind of bellow Greco in terms of quality. 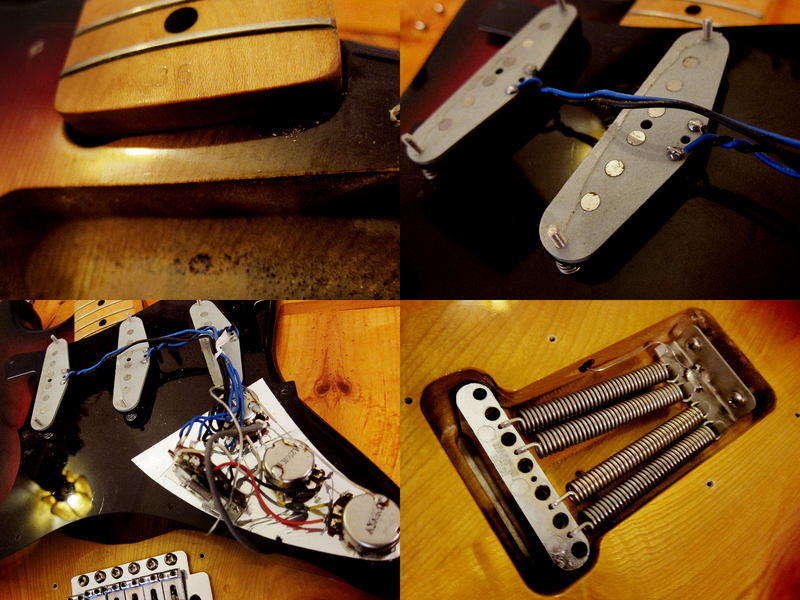 Then again, I can’t really say that I have felt a huge difference in quality between the Fender Japan made by FujiGen or the ones by Tokai, but everyone seems to prefer the Made in Japan to the later Tokai built Crafted in Japan. I have a 1991 Tokai Love Rock LS-55 Les Paul copy that is awesome but that doesn’t mean that an entry level Strat from 1979 would be equally good, but luckily it was. The Tokai Silver Strat SS-36 was the cheapest in the line of the late Seventies Fender copies that Tokai made but I think the main difference between the top and the bottom was if they had 3 or 4 screws bolt-on-necks, how many pieces of wood was used for the bodies and the quality of machine heads and hardware, and less about the pickups. Or perhaps these are the shittiest pickups Tokai produced and they still sound awesome. The guitar has a really nice soft U-shaped 1-piece maple neck with a nut width of just 40.6 mm, which didn’t feel that different to me. The body is 4 pieces Sen (Japanese ash) with poly lacquer in the classic 1970’s Fender 3-tone sunburst, which I truly love. I’m not sure if the pickups are similar to the L-5000 Vintage Arched PP Grey Bobbin pickups that the Fernandes RST-50 ’57 had or just some other grey bottom pickups. I tried to find some more information about them but they are just refereed to as grey bottom Tokai PU at Music-Trade Japan. Tokai Was building Fernandes at this time so I assume they would have used similar pickups for both. Either way, I love the pickups in this Tokai and it sounds almost as good as the Fernades did. I added an extra spring to the tremolo block since I never use the wammy bar and prefer a more solid hardtail feel, just like a real late 1970’s Fender Stratocaster. I will try to get a new video up soon where I play a bit louder so you can hear the pickups properly, I was worried about the neighbours, and ideally play a bit better. Well here it is, I might not play any better, but at least it is a more of it. I changed the string to 010, always Ernie Ball Regular Slinky, raised the action and fitted a 4th spring to the tremolo. Not sure what difference it made sound vice but it made it felt better to me playing.